Dr. Chander MD & His Experienced Team of Medical Professionals Offer a Wide Variety of Services: Primary Care, Pain Management, Brain Health & Much More. 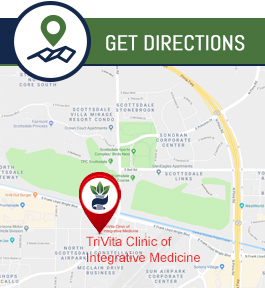 TriVita Clinic of Integrative Medicine Is Conveniently Located at 16100 North, Greenway Hayden Loop, Suite G-100, Scottsdale, AZ 85260. Please Call at (480) 725-4474 or Request an Appointment Online. TriVita Clinic of Integrative Medicine uses the latest conventional and evidence-based complementary medicine to help you achieve optimal health. Your healthcare team will perform physical exams, diagnostic testing and explore your lifestyle habits such as nutrition, activity, stress and sleep to adequately assess your overall health and lifestyle to create a personalized plan to help you achieve optimal health and well-being for your life purpose.